Kings Canyon and Sequoia National Parks sit side by side in central California. Filled with alpine peaks, deep canyons, and the largest trees in the world, you could spend several days here. However, if you only have one day, you have just enough time to visit the highlights of both parks. 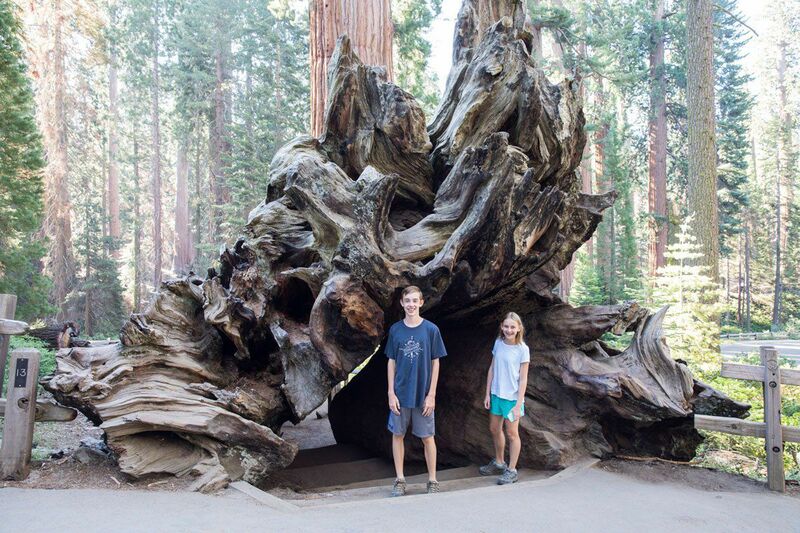 We visited Kings Canyon and Sequoia National Park on a road trip through California. Our day started in Mariposa, located just outside of Yosemite National Park. In the morning, we drove south to Kings Canyon, spent the day exploring both parks, and ended in a small, nearby town. 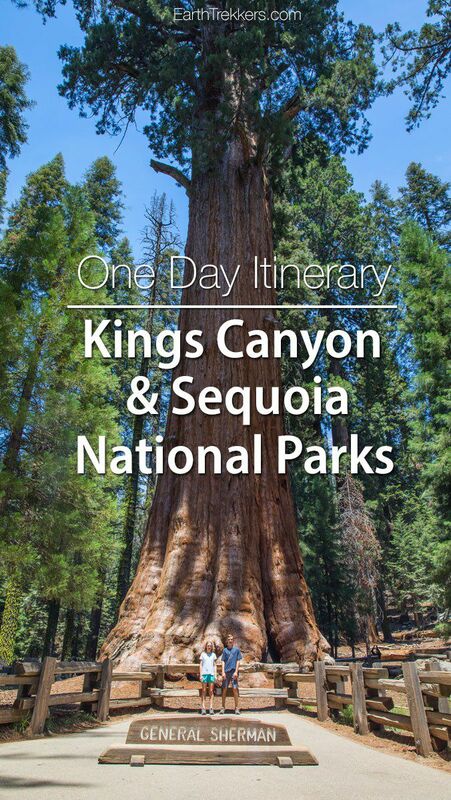 Here is our one day itinerary for Kings Canyon and Sequoia National Parks. 9:00 am: Arrive no later than 9:00 to Kings Canyon. Even earlier is better. 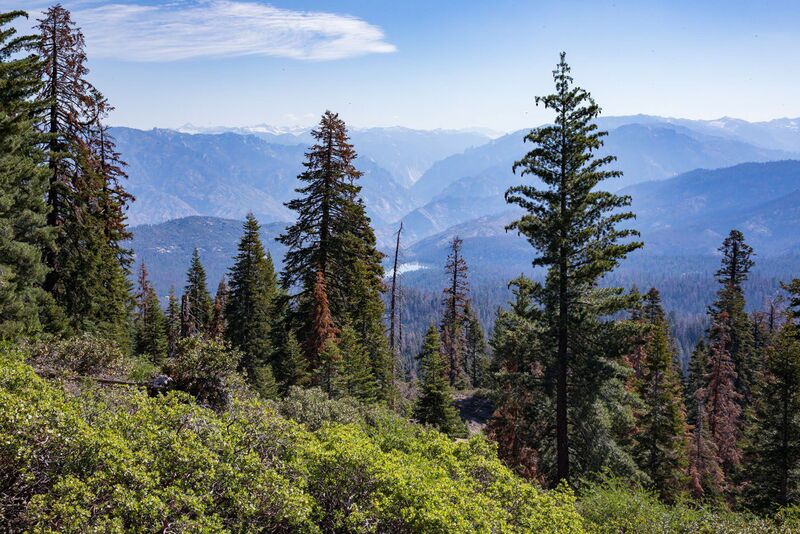 There are two main sections to Kings Canyon: General Grant Grove and Cedar Grove/Zumwalt Meadows. 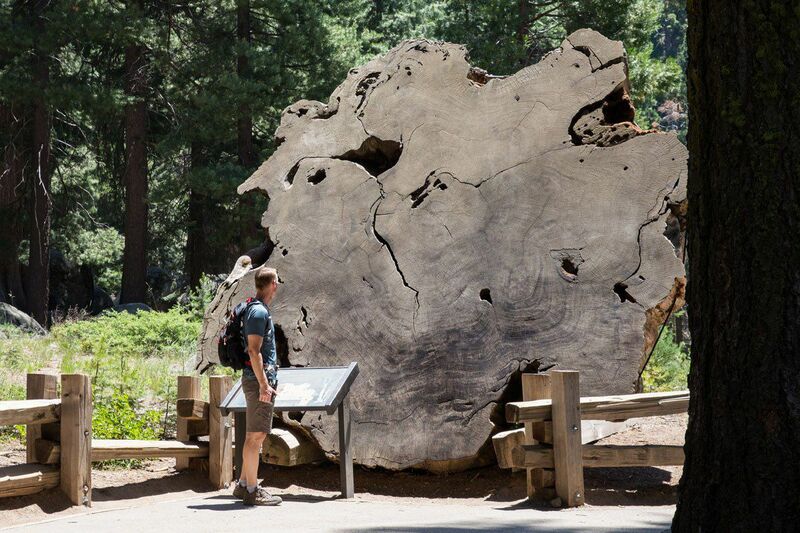 General Grant Grove is home to the largest sequoia trees in Kings Canyon, including General Grant, the second largest tree in the world. 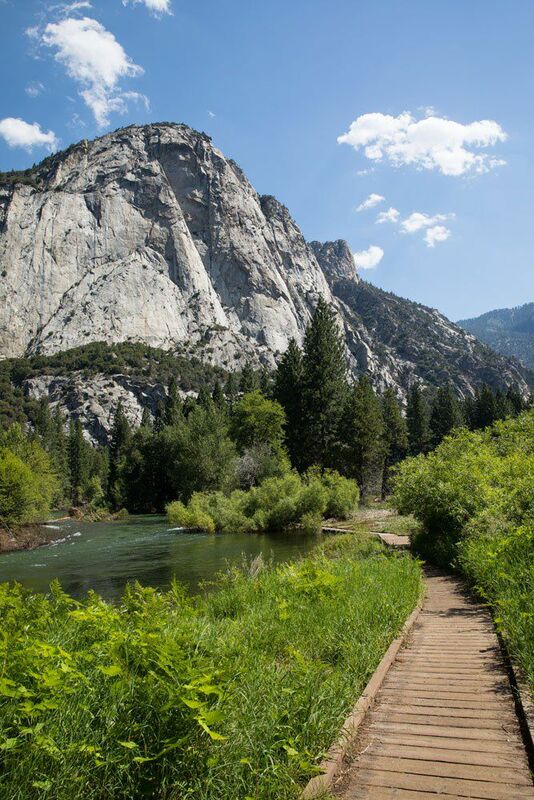 Cedar Grove and Zumwalt Meadows are located in the valley of Kings Canyon. This is a gorgeous place to visit and for those who want to explore the backcountry of Kings Canyon, this area is the jumping off point. The only vehicular entrance into Kings Canyon is at the west side of the park near General Grant Grove. For us, it was a 2.5-hour drive from Mariposa to get here. We started very early in the day (leaving at 6:30 am from our hotel) in order to maximize our time to explore both parks. General Grant Grove is located just beyond the entrance to Kings Canyon. 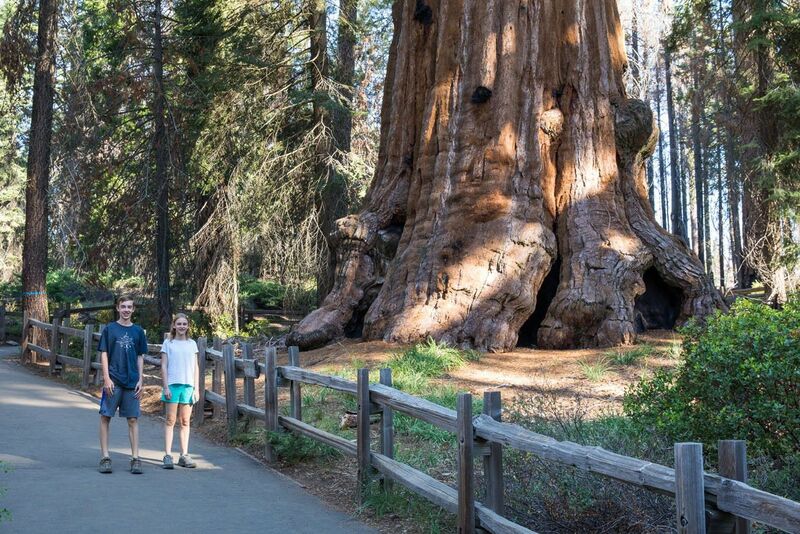 The General Grant tree is the world’s second largest tree. 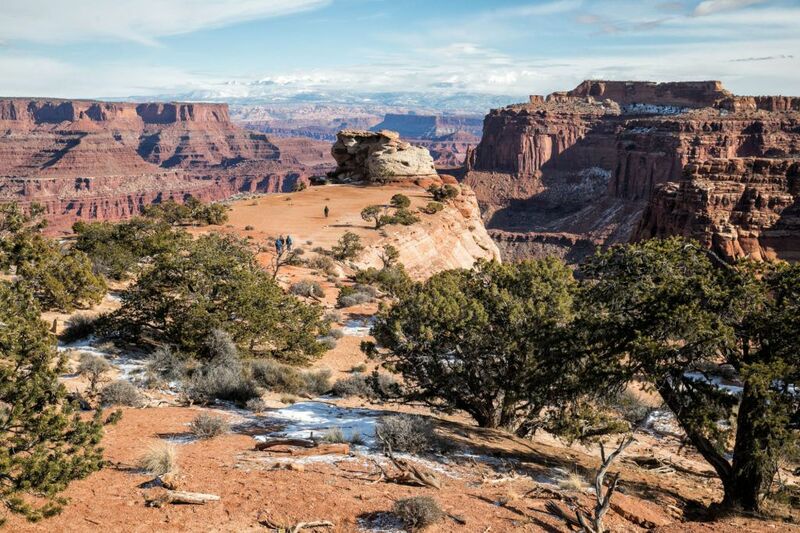 Walk the 0.3-mile loop and feel tiny as you stand next to these giants. The General Grant tree is also known as the nation’s Christmas tree. On the second Sunday of December, you can “Trek to the Tree,” an annual Christmas celebration in the park. After Grant Grove, we crossed Highway 180 and drove on a very narrow and very curvy road to Kings Canyon Panoramic Point. It takes about 30 minutes of driving round trip to get to this point and enjoy the view. Is it worth it? It’s a nice view but it is skippable if you just want to move on to the more popular sites. The Kings Canyon Scenic Byway is Highway 180. It is 50 miles long, starting at the Hume Lake Ranger District (located east of Kings Canyon, outside of the park) to Cedar Grove. The drive from Grant Grove to Zumwalt Meadows on this road is 30 miles long and takes between 45 minutes and an hour. It is a beautiful drive, but don’t expect the wide, awe-inspiring panoramas you would see at Yosemite or Yellowstone. The road winds along the mountains, descending down into Kings Canyon. There are several spots for photos at the scenic overlooks. Travel Tip #1: This is a very, very windy road. If you suffer from motion sickness, make sure you take your Dramamine or anti-nausea medication before starting this drive. 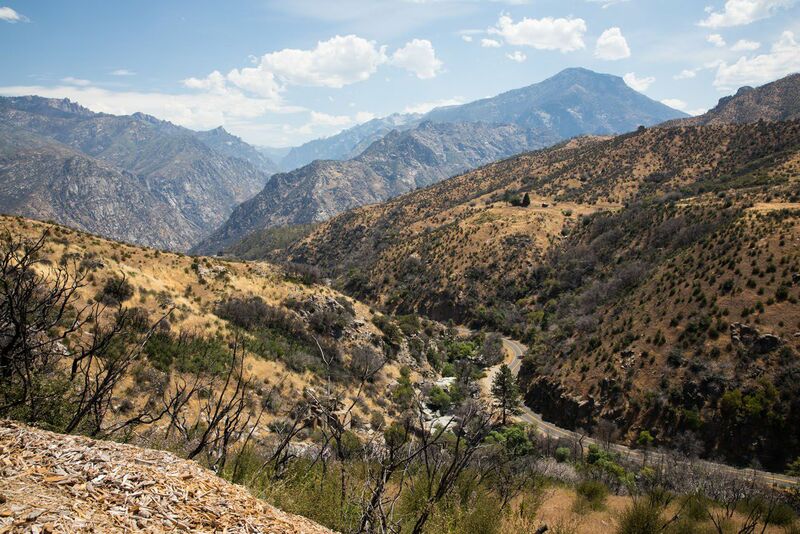 Travel Tip #2: The Kings Canyon Scenic Byway is only open from mid-May through mid-October. At the end of the Scenic Byway is a parking area. Get out, stretch your legs, and go for an easy walk. There is a flat walking trail into the Zumwalt Meadows. You are now down in the heart of Kings Canyon, with the mountains looming overhead. Nearby, you can also visit Grizzly Falls, located just off the road near Cedar Grove. From Zumwalt Meadows, travel back along the Scenic Byway. Next up is Sequoia National Park. 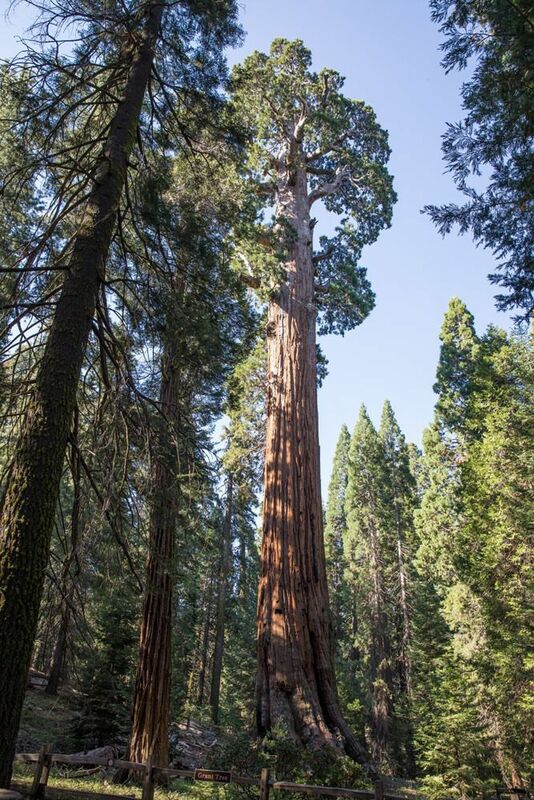 Sequoia National Park is home to the General Sherman tree, the largest tree in the world. Did you know that Sequoia National Park is also home to Mt. Whitney, the tallest mountain in the contiguous United States? Sequoia National Park is the more popular of the two parks. During the summer months, expect to share the views with lots of people. These giant trees attract quite the crowd. To get to Sequoia National Park from Kings Canyon, drive south past Grant Grove and follow the signs for Sequoia National Park. Now you will be driving on Generals Highway, the scenic road that connects the two parks together. The drive from Zumwalt Meadows in Kings Canyon to our first stop in Sequoia, the General Sherman tree, takes 1.5 to 2 hours (63 miles). Along the way, you can stop at the Grant Grove Restaurant (Kings Canyon) or at the Lodgepole Deli (Sequoia) for lunch. 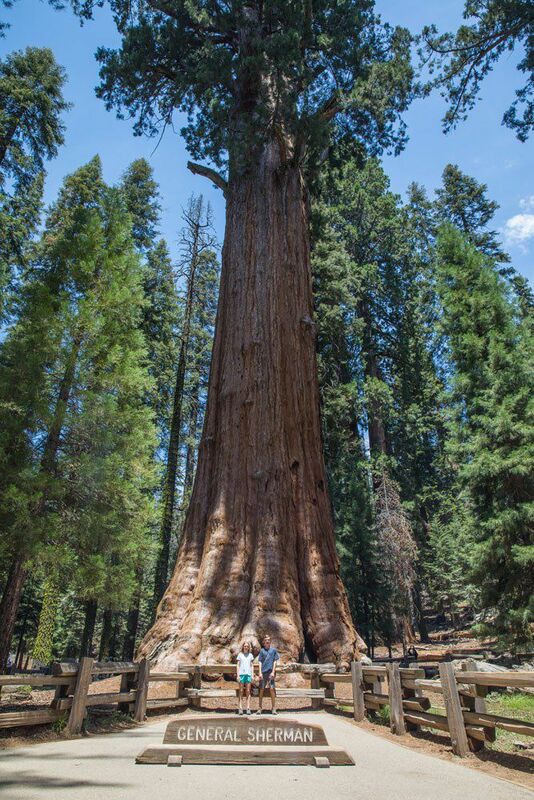 The General Sherman Tree is the world’s largest tree, by volume. It is 275 feet tall (almost as tall as the Statue of Liberty) and has been growing for 2,300 to 2,700 years. Just think about how much human history has taken place during this one tree’s lifetime. 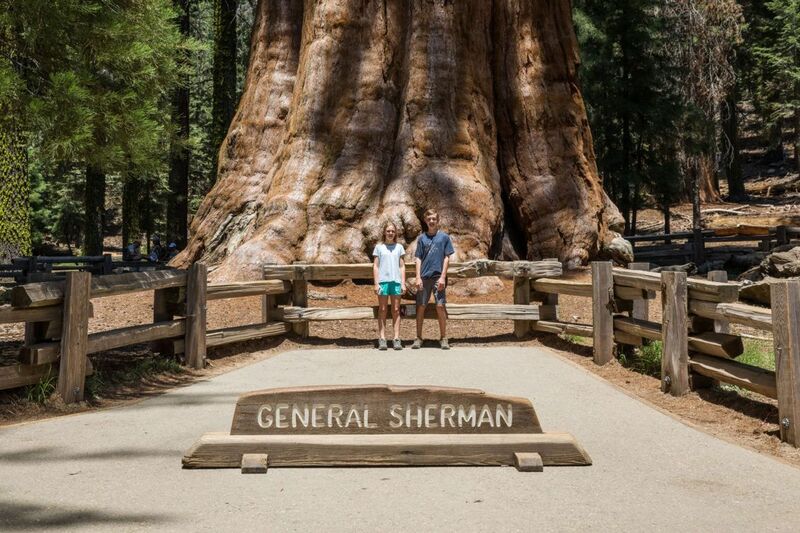 The General Sherman Tree is located in the Giant Forest. There are many giant sequoias here, but finding the General Sherman is easy. 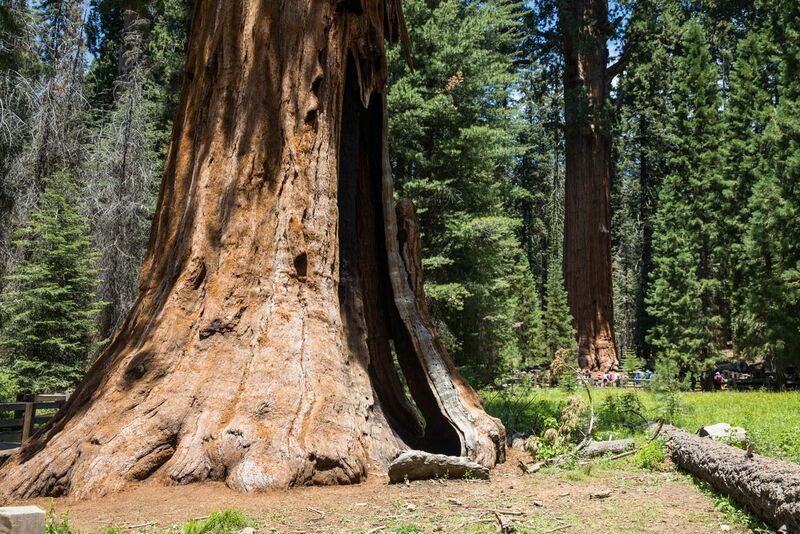 Not only is the General Sherman massive in size, it will also be the tree with a crowd of people standing around it. Walk the General Sherman Trail, a short walking trail that wanders through this grove of giant trees. 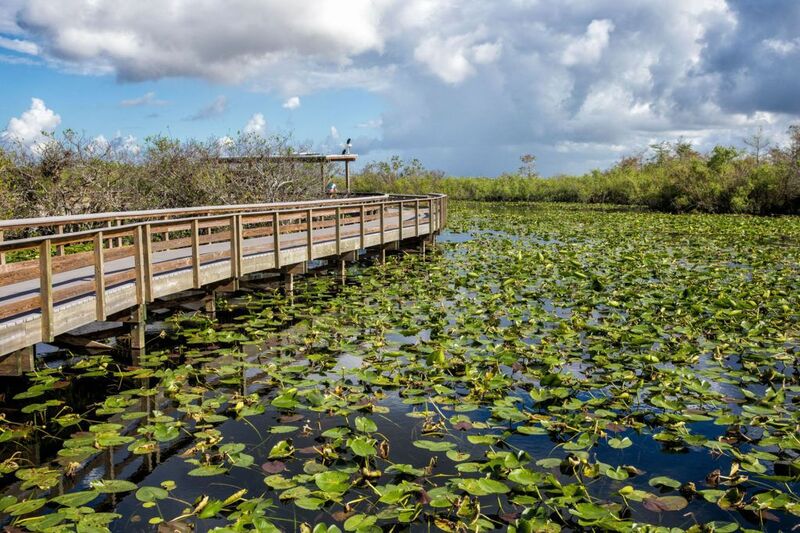 If you want to explore further, walk the Congress Loop, a 2-mile loop that heads further into the forest. 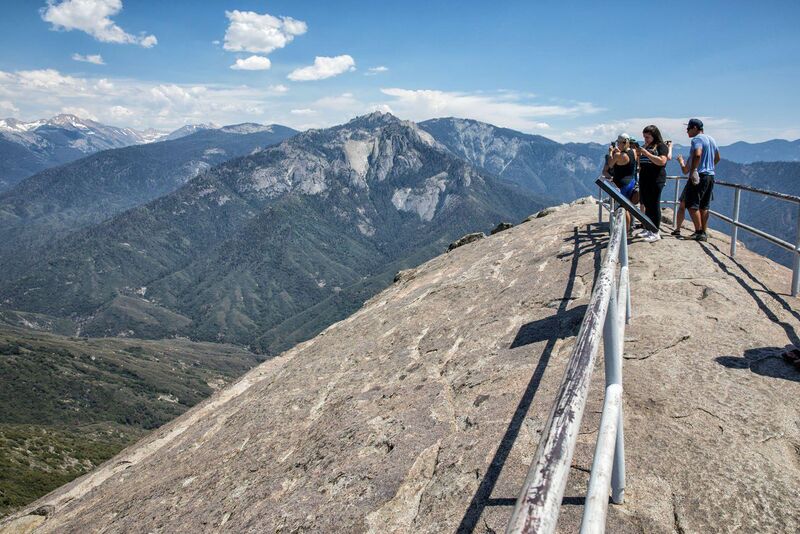 Moro Rock is a short but strenuous climb to a fabulous viewpoint in Sequoia National Park. This is well worth the effort. To get to the top, you will climb 400 steps (0.6 miles round trip) to the summit of a granite dome. For us, this was our favorite viewpoint of the day. 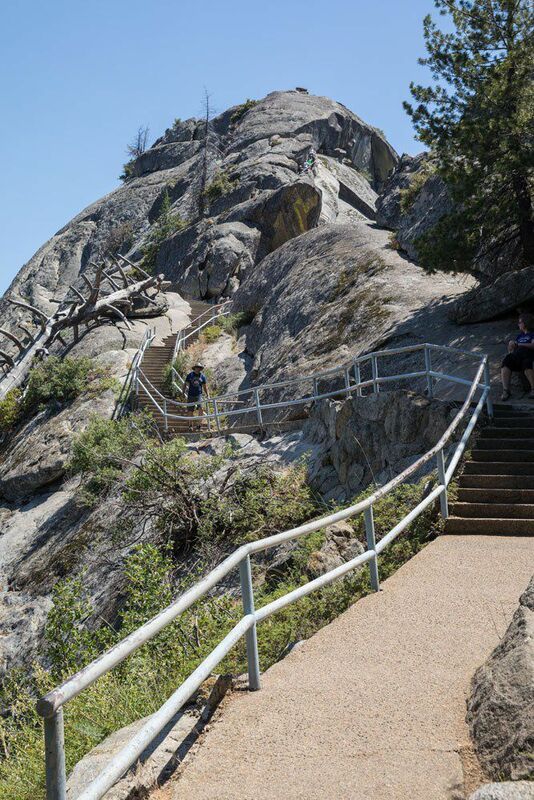 Getting here: On weekdays, you can drive directly to Moro Rock on Crescent Meadow Road, but parking is limited. Consider taking the free shuttle from the Giant Forest Museum. On weekends and holidays, the road is closed to private vehicles and the only way to get here is via the shuttle. During the winter months, the road is closed, so the only way to get to Moro Rock is by hiking the 2 miles to it from the Giant Forest Museum. 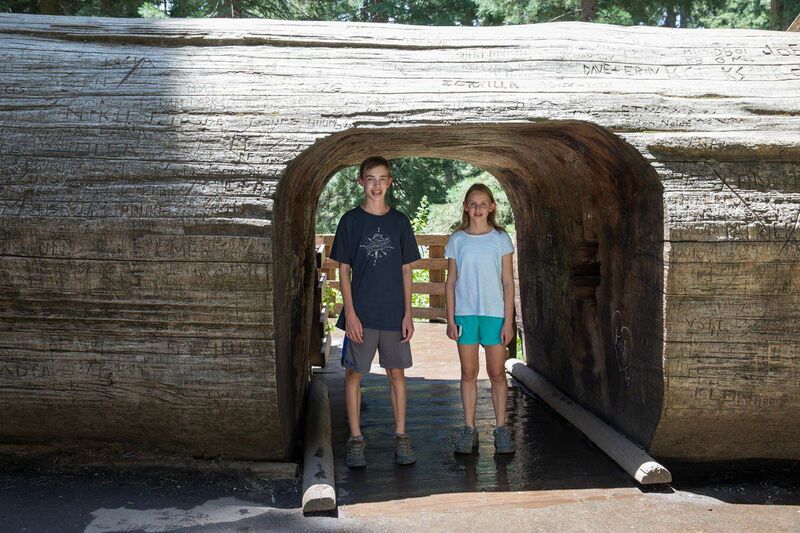 Tunnel Log is a passageway that was carved into a fallen sequoia tree. Visitors to the park can drive through this tunnel, but only on weekdays when Crescent Meadow Road is open. We were here on a Saturday so we had to take the shuttle. During our visit, the shuttle drove right past Tunnel Log so we could only see it on a drive-by. You do have the option to walk here from Moro Rock. It is a 0.75-mile walk one way and should take about 15 minutes to get there. Crescent Meadow is a quiet meadow located at the end of Crescent Meadow Road. There is a 2-mile leisurely walk (Crescent Meadow Loop) through alpine forests and a meadow filled with wildflowers during the summer months. Go underground and explore this marble cavern. To visit Crystal Cave, you can only do so on a tour. Tours last 50 minutes and cost $16 for adults and $8 for children. We skipped Crystal Cave. To get here, it is one hour of driving round trip from the Giant Forest Museum. Add in the time for the tour and this little excursion takes about half of a day. For us, the thought of walking through a cave on a guided tour sounded uninteresting. 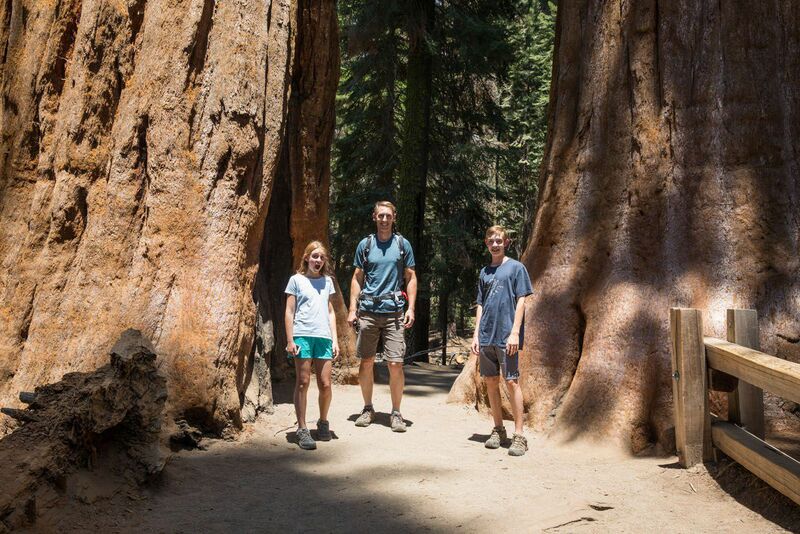 With the limited time we had, we would rather wander among the giant sequoia trees and explore Kings Canyon. Even though we didn’t do it, I still wanted to include Crystal Cave in this post since this is a popular spot to visit in Sequoia National Park. Learn more about Crystal Cave. From Moro Rock, we drove south on Generals Highway, exited Sequoia National Park, and drove to Visalia. Visalia is a good-sized Californian town with lots of options for accommodations and restaurants. We stayed at the brand new Holiday Inn Express. Another place to consider is Three Rivers. This town is a short drive from southern entrance to Sequoia National Park. It’s a very small town with limited options for accommodations and restaurants, but it is close to the park entrance. 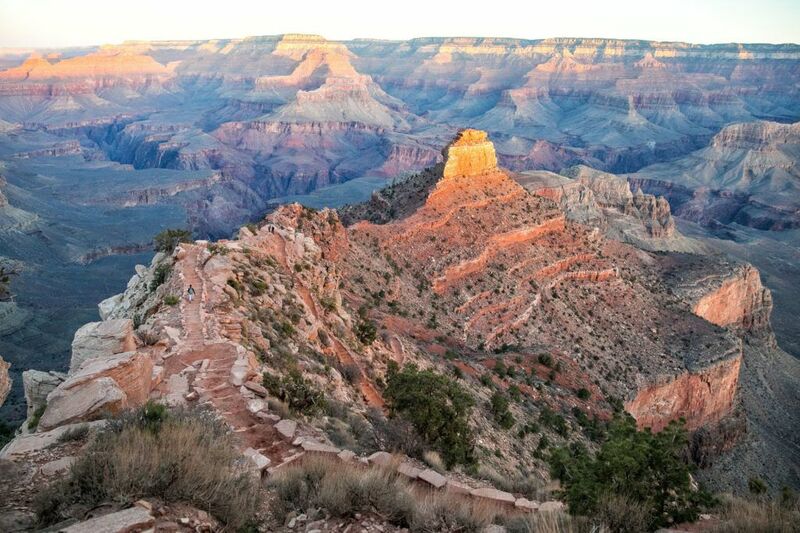 The National Park Service charges $35 for a vehicle pass. 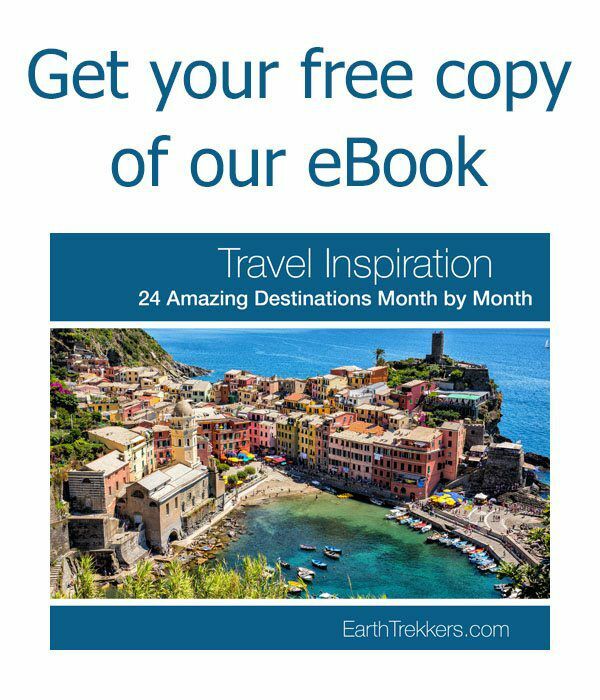 This fee includes both Kings Canyon and Sequoia National Park and is valid for up to 7 days. To save time at the entrance, you can purchase your ticket online in advance. 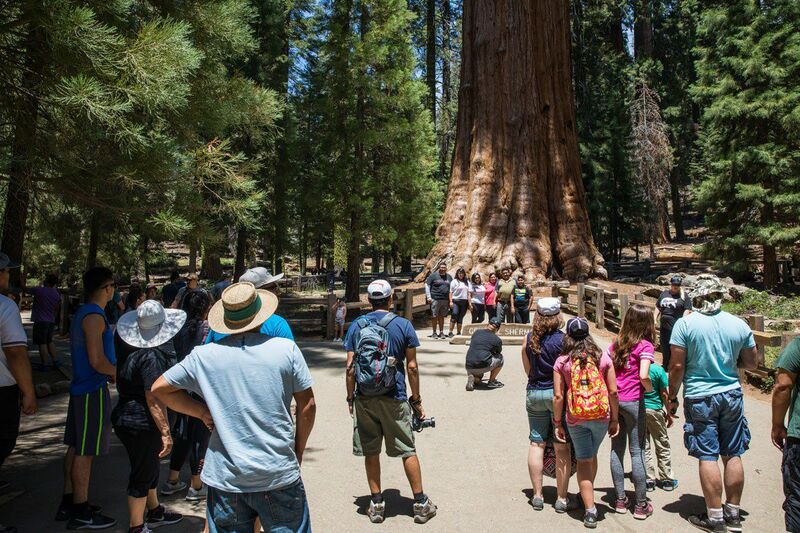 Kings Canyon and Sequoia National Parks are open 24 hours a day 365 days per year. However, road closures due to snow will limit access to several areas of the park from October through May. In this itinerary, the most crowded spots will be the General Sherman Tree, the General Grant Tree, and Moro Rock. During our visit on a Saturday in July, parking in Sequoia National Park was extremely limited. We found a parking spot on the side of Generals Highway and had to walk up to the Giant Forest and to the shuttle for Moro Rock. The National Park Service operates a shuttle in Sequoia National Park. This shuttle connects Moro Rock, the Giant Forest Museum, and the General Sherman tree for free. Learn more about the shuttle service here. To avoid the worst of the crowds, especially during the summer months, it helps to get an early start to the day (7 am is ideal). By 9 am, Kings Canyon and Sequoia are filling with people. The earlier you get here, the more you can do crowd-free. 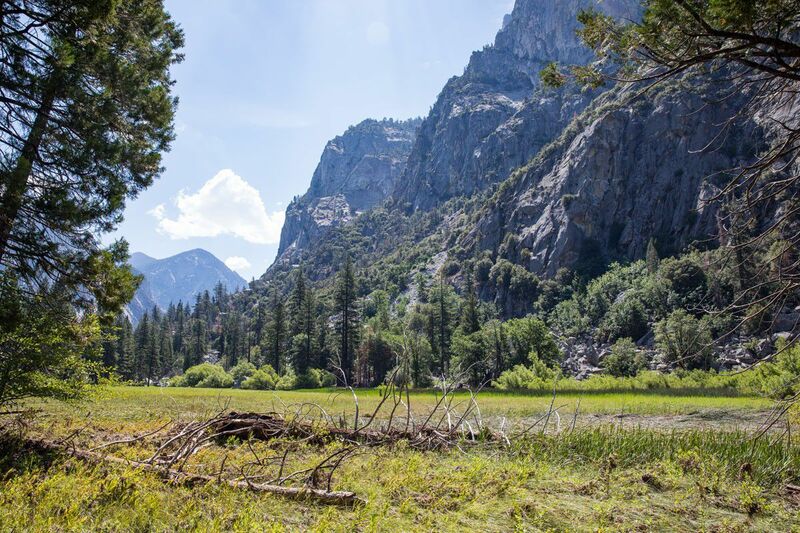 Are you going to Kings Canyon and Sequoia National Parks? If you have any questions, comment below. 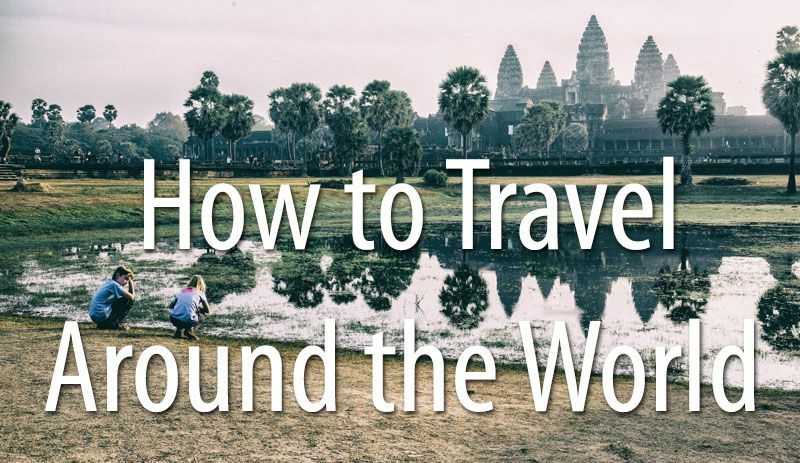 Planning a trip to the United States? 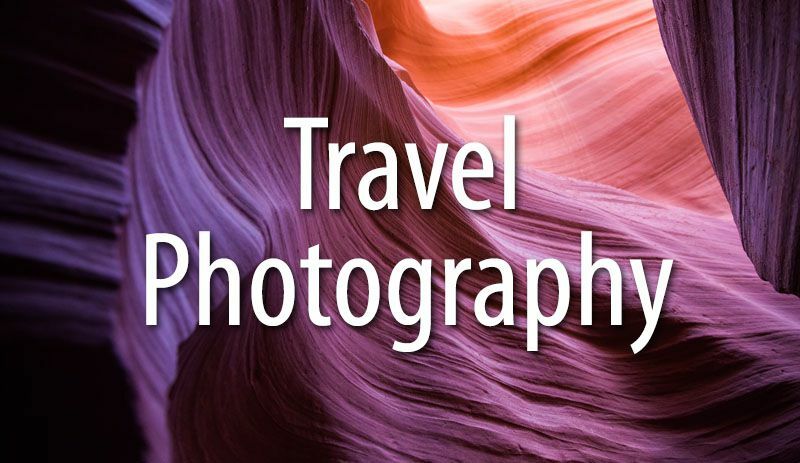 Read all of our articles in our United States Destination Guide. Thank you very much. I helped me a lot on planning. Congratultions. Congrats on your posts, I love them and found them very useful!! Im going to Yosemite on September and planning on staying 3 nights over there, and we are considering going to Sequoia for one night. What do you think? Are Sequoia and Kings Canyon worth the 3 hr drive? Or should we give an extra day to Yosemite or San Francisco? Just what I thought!! we will visit sequoia on a different schedule! Thank you so much for your answer!! Hi thanks for this review. 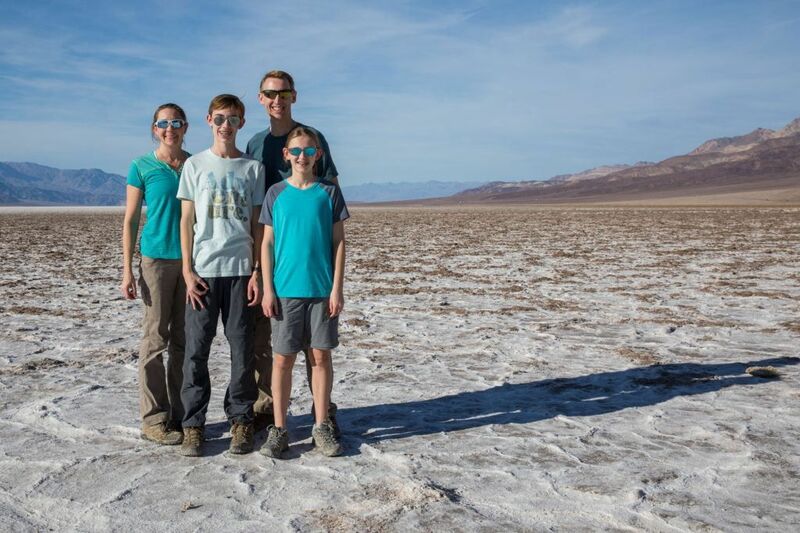 I am thinking of doing a similar day trip to you encompassing both Kings Canyon and Sequoia in one day, I know this will just enable me to see the highlights – my question is….did you feel like you saw the major sights of both parks without missing too much out? I’m time limited but equally want to try and see as much as possible without rushing too much and spoiling the day! Many thanks for taking the time to reply. I will follow your recommended route. 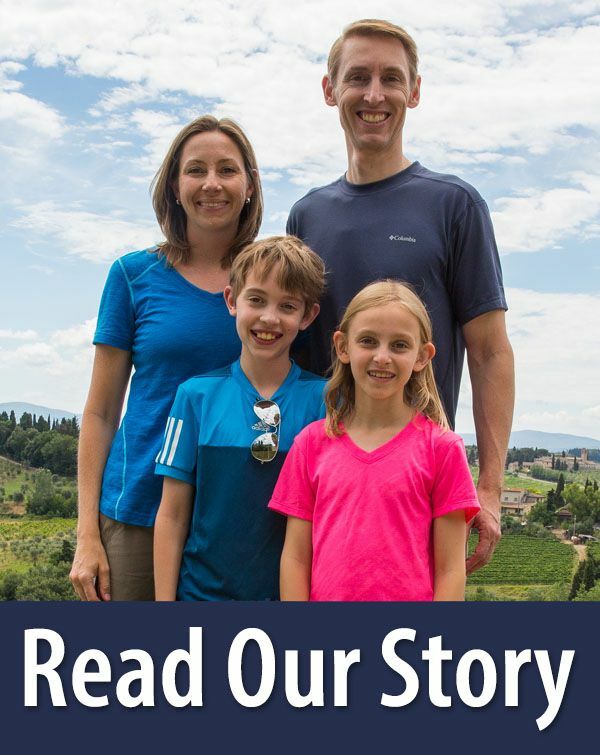 Your website is great and very inspiring! Best wishes from London, UK. 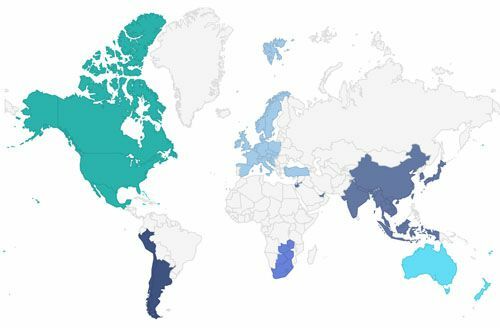 Hi, I came across your site when googling what to do when we are in this area of California in late September (we are from Ontario Canada). We will be in the Monterey area the weekend of Sep 22, 23 and had originally planned to go over to Yosemite early in the week but with the recent fires and the rumor of huge crowds, we are now contemplating instead heading south on Hwy 1 to see the Hearst Castle then over to Sequoia and Kings Canyon but would only have one day to do both parks. 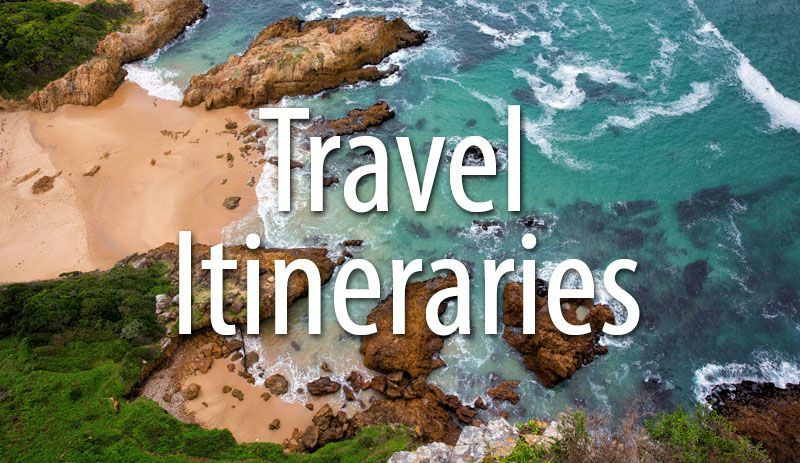 We would be doing your itinerary in reverse! I guess my question is, are our fears of Yosemite unfounded and would you recommend to go back to Plan A or stick with the Hearst/Sequoia/Kings Canyon plan? 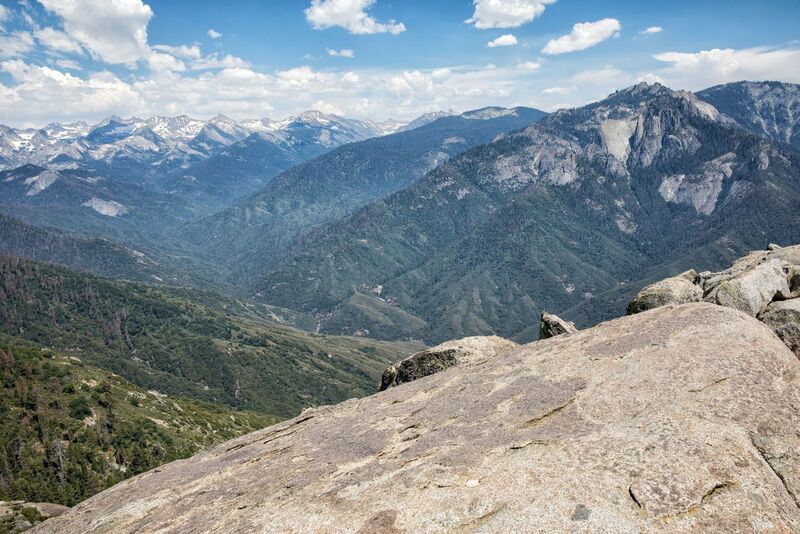 According to the National Park website, Yosemite Valley is open now but Glacier Point is not. That will probably change by your visit in September. Are they expecting larger crowds in September? I haven’t heard anything about it, but I guess it is possible for people to change their travel dates and come in September instead of the summer this year. Families will be home, since school will be in session. I would think it could go either way…your guess is as good as mine. Sequoia and Kings Canyon are great, and they are worth visiting, but Yosemite is much better, in my opinion. I have heard awesome things about Hearst Castle but we have not been there yet. It’s a toss up and I don’t really know what to tell you. If you need to make hotel reservations now, why not make refundable reservations for both parks and keep checking back with the status of Yosemite? Even if Yosemite is crowded it’s still a great experience. Just get in very early in the morning (before 7 am) so you can hike or do the scenic drives before everyone else arrives at 9 am. Thanks for the quick response Julie! I like your idea of making refundable reservations for both areas and then monitoring as we get closer. I think i will go ahead and do that.. thanks again. 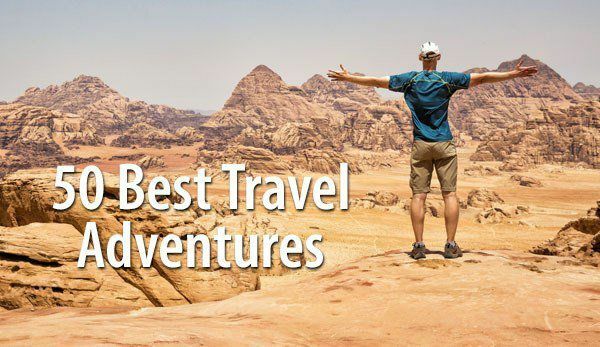 This sounds like an excellent trip! I have a few days in October and am trying to decide between the giant Redwoods or Sequioa. Do you have an itinerary for the Redwoods as well and/or which would you suggest as a more “must see” trip? Thanks for your help! So excited to find your post! My son was just promoted to triple A ball in Fresno so we will be looking for some day trips and these parks look like great options . Congrats to your son! Have fun exploring the parks! This is exactly what we needed!! Thanks for the awesome tips! Hello, how long doe the crescent meadow hike take for an average hiker (back and forward)? Is it a loop? It’s a 2 mile loop and can take about 45 minutes. An excellent review! I would say a person or family would need at least several days to enjoy all the points of interest at both parks. Your one day roll up will serve us well as we had a late jump arriving into the Giant Forest Museum. We were fortunate enough to secure lodging in Grants Grove for our next day exploration. Thank you for sharing your insightful information.